The 21st-century kitchen is a hot spot of activity, a central hub for gatherings, and a space that serves a myriad of purposes. From food prep and cooking to homework and hanging out, the kitchen has changed drastically over the past 100 years. Kitchens weren’t always the heart of a home. Over a hundred years ago, upper-class families had their kitchens built behind main living areas and far from any social or dining areas. The room was purely used as a workspace and nothing more. The rise of the working middle class moved kitchens closer to living areas as individuals began occupying smaller living quarters. Margarethe Schutte-Lihotzky from Frankfurt is credited for building the first efficiency-inspired kitchen of the 20th century in the mid-1920s. In a space of only 6 feet by 11 feet (1.8m by 3.35m) she was able to optimise kitchen work by reducing cooking time and reducing the cost of building well-equipped kitchens. Her design became the standard for many 20th century homes. Frank Lloyd Wright’s architecture is said to have inspired the open kitchen design in suburban homes. He designed Usonian homes and Prairie School houses, both of which featured “open plans” where living and dining areas were combined into one another rather than being separated by walls. This design drew the kitchen away from the hidden back of the home to its centre. The intention was to make food preparation and delivery more practical for everyday families, and it also consequently reduced construction costs, increased efficiency, and began to have a notable social impact on families, with other family members now spending more time in the space than before. Decades ago families would be horrified by the thought of hosting a dinner party in their kitchen. Instead, they would carry the food to a separate well-prepared dining area. Thanks to cooking shows on the television, recipe websites, and apps, cooking has become much more of a social and creative act. Homeowners want to have an open and well-equipped kitchen that will act as a stage where they can show off their culinary skills while still being able to carry on a conversation with friends and family. The demand for more kitchenware like pans, utensils, and ingredients created a need for more storage and food prep space. The room continued to expand with many modern homes now featuring open concept spaces where the kitchen, dining area, and living areas all flow seamlessly into one another. This growth has also seen the so-called “work triangle” layout (where the fridge, oven, and sink were placed close together so one person could prepare food) although not as prevalent in large size kitchens the work triangle is still used as a basic design functionality. The modern kitchen is now built with comfort, efficiency and creativity in mind. It has transformed into the heart of the home where treasured memories with families and friends are made. 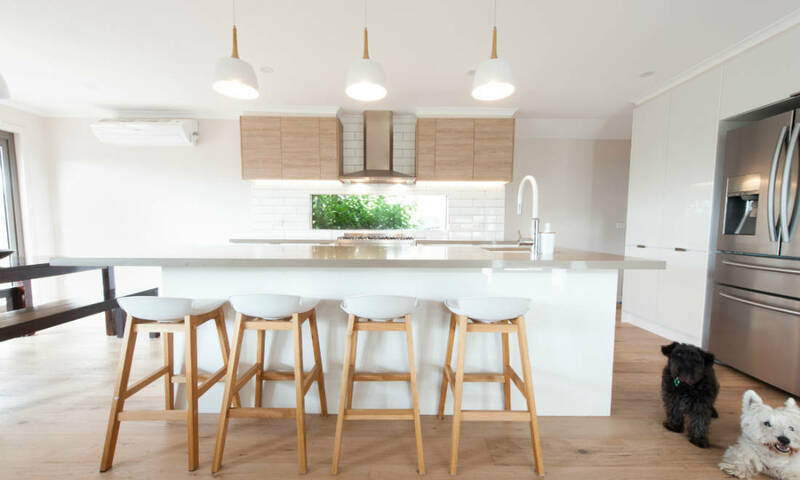 For gorgeous kitchen design inspiration, we invite you to see our kitchens and give us a call to arrange for your free in-home kitchen design at 1300 100 555.